Bandar Seri Begawan - To commemorate the longstanding diplomatic relations between Singapore and Brunei Darussalam, a joint stamp issue themed 45th Anniversary of Currency Interchangeability Agreement (CIA) will be released on November 27, 2012. This joint stamp issue celebrates the currency union between Singapore and Brunei Darussalam. Under the Currency Interchangeability Agreement (CIA) which took effect on June 12, 1967, each country undertakes to accept the currency issued by the other, and to exchange it at par and without charge, into its own currency. Forty-five years on, Singapore and Brunei continue to build on this strong historical bond to grow bilateral trade and cooperate on a wide range of areas including tourism, health and education, Singapore's Ministry of Foreign Affairs said in a press statement. 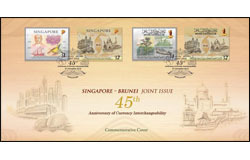 The Singapore-Brunei joint stamp issue comprises three stamp designs - one of the stamps features the back of the 40th CIA anniversary commemorative note issued in 2007 to highlight the milestones achieved in the CIA, while the other two showcase the respective iconic elements in Singapore and Brunei currency notes. Singapore's stamp depicts the themes of its past and current currency notes namely, the "Orchid" series (1967-1976), the "Bird" series (1976-1984), the "Ship" series (1984-1999) and the "Portrait" series (1999-present). Correspondingly, the Vanda Rothscildiana "Teo Choo Hong" on the S$50 banknote, the Yellow-breasted Sunbird on the S$20 banknote, the barter trading vessel "Palari" on the S$10 banknote and the portrait of Singapore's first President, the late Encik Yusof bin Ishak on the S$1,000 banknote are featured on the stamp. Brunei's stamp also showcases four series of their currency notes - the illustration of Omar 'Ali Saifuddien Mosque on all of their 1967 banknotes, the view of Padian (the Water Village woman vendor in her boat) on a Brunei banknote in 1989, the view of a Rainforest Floor on the $5 polymer notes in 1966 and lastly, the Bunga Tapak Kuda Laut (or Ipomoea Pescapre, a medicinal plant with purplish flowers found along the beaches of Brunei) on the $20 banknote in 2007. The 40th CIA anniversary commemorative note on the S$2 stamp and the Singapore currency notes on the S$1 stamp will be on sale from November 27, 2012. SingPost will also be releasing a Miniature Sheet comprising the complete set of stamps (S$4.25), a Pre-cancelled First Day Cover affixed with two stamp designs (S$3.85), a Pre-cancelled First Day Cover affixed with Miniature Sheet (S$4.90), a Pre-cancelled Commemorative Cover affixed with both Singapore and Brunei stamps (S$7.05) and a Presentation Pack with the complete set of stamps (S$9.10).